Out of the products launched, only the 11.6-inch Trio received a special unveiling -- and with good reason. 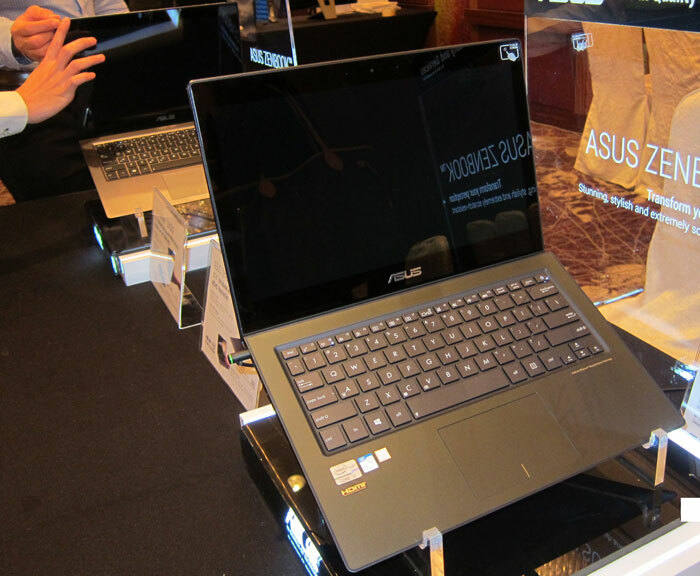 At first glance, it looks like any other Transformer Book in ASUS' product line-up. However, the Trio is able to run Android as well as Windows 8, thanks to the fact that it has two processors, one in the display, and one in the keyboard dock. When the display is removed from the dock, it immediately runs on its dual-core Intel Atom (Z2760, 1.6GHz) processor and on the Android platform. This allows the tablet to consume much less energy, providing a much longer battery life (it has a 19Wh or 4430mAh battery) for all-day use. What's more interesting however, is the device's keyboard dock, or PC station. It has a fourth generation Intel Core (i5-4200U or i7 4500U) processor normally found in Ultrabooks, and a 33Wh lithium polymer battery built into it (13 hours in Android mode, 5 hours in Windows 8 mode). Since the keyboard dock has an Intel Core processor , users can simply hook it up to a larger display (using its mini DisplayPort or micro-HDMI port), to use it as a PC (hence it's PC Station moniker). When the display is docked, the whole device becomes a fully functional Ultrabook, with the Intel Core processor becoming the dominant chip. Users can also choose between using Android or Windows 8 in this mode. We've also had the opportunity to have a brief hands on with the Trio, and we found that it had a fairly good built quality. Both the 0.7kg tablet and the 1kg keyboard dock was covered with aluminum, a premium material that gives the devices a rigid and sturdy build while also allowing it to be light. We were also impressed with the keyboard, which was on the small side, but had very rigid chiclet-style keys that enables comfortable and error-free typing. 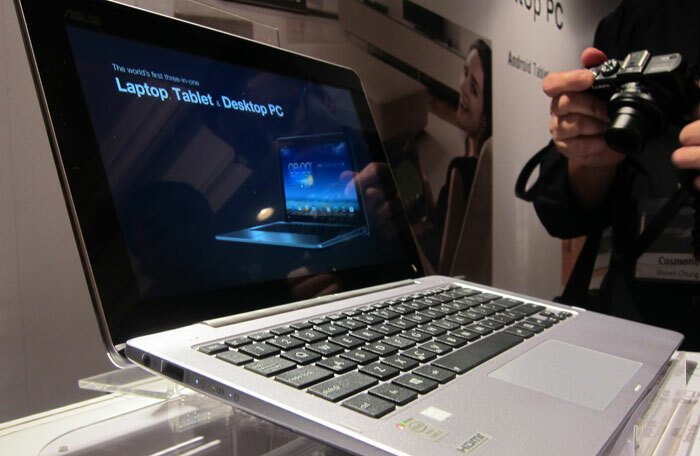 The large clickable trackpad also allows easy navigation around the operating system. Consumers who require their computing devices to be as convenient as the three-in-one ASUS Transformer Book Trio, will be able to purchase the device on 2 November. The Intel Core i5 model will retail for $1698, while the Intel Core i7 model will retail for $1998. More details on the configuration options will be available soon. 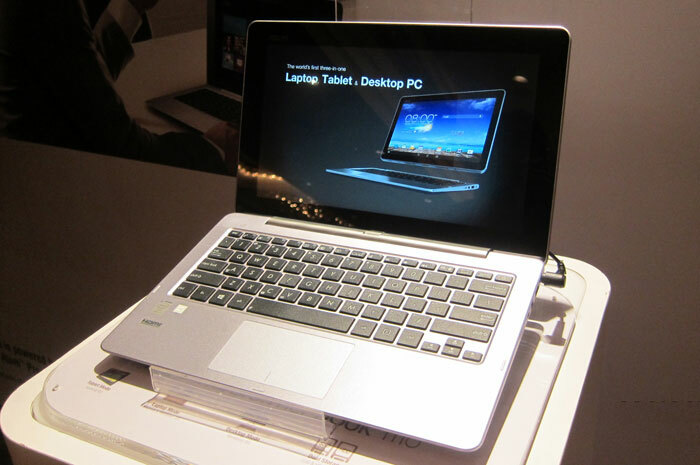 As we mentioned earlier, ASUS also took the opportunity to launch two Ultrabooks -- the UX301 and UX302. Externally, both devices have very similar designs. There's the familiar spun metal design on the aluminum lids of the machines, while a layer of thin but scratch-resistant Corning Gorilla Glass 3 protects the lid from scratches, a problem which the original Zenbook (and most aluminum notebooks) faced. 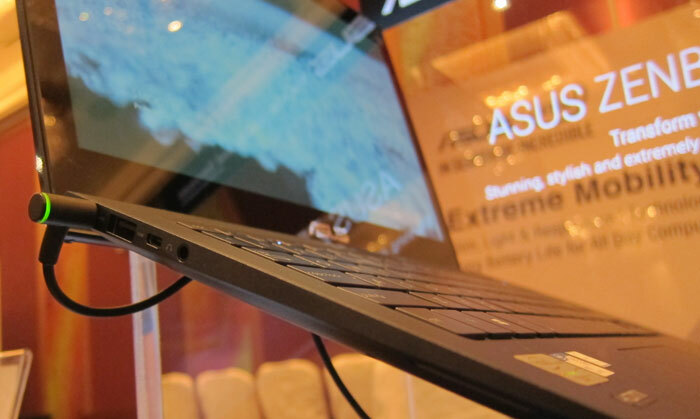 According to ASUS, the thin layer of glass also provides the machine's lid with additional rigidity on top of the durability that the aluminum already provides. However, external design is where the two devices share any similarity. 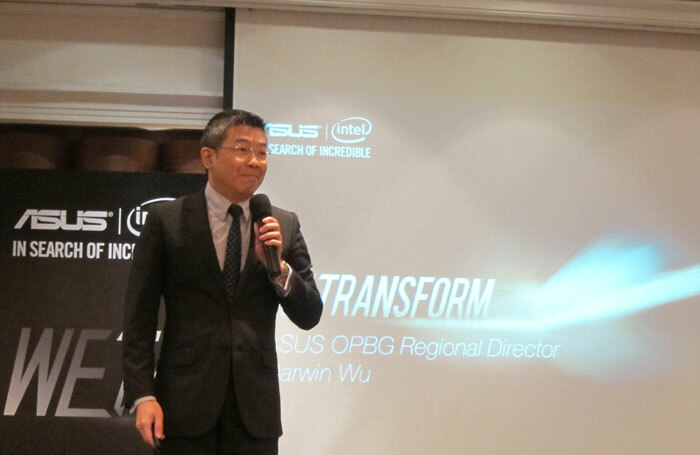 ASUS has yet to reveal prices, but according to the devices' specifications, the UX302 is engineered to be more cost efficient, while the UX301 is on the premium side of the scale. The UX301 sports an Intel Core i7-4558U that also comes with a superior Intel HD graphics 5100 onboard GPU, 8GB of RAM and a 128GB SSD (up to 256GB SSD), while the UX302 comes with an Intel Core i5-4200U or Intel Core i7-4500U processor, and has an NVIDIA GeForce GT 730M discrete GPU, 4GB of RAM and a regular HDD (Core i5 - 500GB HDD, Core i7 - 750GB). While both machines have the same 13.3-inch display sizes, the UX301 also has a higher resolution WQHD (2560 x 1440p) display, while the UX302 has a reasonable full HD (1920 x 1080p) display. Due to the different components used, the UX301 is slight thinner and lighter. It weighs 1.38kg and measures only 15.5mm thin, while the UX302 weighs 1.5kg and measures 17.2mm thin, which gives the UX302 a bit more space for a full-sized HDMI port and an extra USB 3.0 port (the UX301 has a micro-HDMI port, and 2 x USB 3.0 ports instead) However, the battery capacity (50Wh), connectivity options are similar. Both sport the latest 802.11ac (dual-band) Wi-Fi connectivity, Bluetooth 4.0, mini DisplayPort, 3.5mm audio jack and SD card reader. To get a better understanding of the differences between the two notebooks, refer to the table below. Unfortunately for consumers who are keen on getting their hands on a UX301 or UX302, ASUS wasn't able to confirm the availability and prices of these two notebooks for the local market. However, we believe that they will be available in stores before the year ends, and we'll keep you updated once we receive word from ASUS. The ASUS FonePad 7 doesn't exactly transform from anything into anything other than what it is, but it does give users the best of both worlds. It's essentially a 7-inch tablet, that has the ability to make phone calls, so that you get the convenience of a mobile phone, and the usability of a 7-inch tablet. 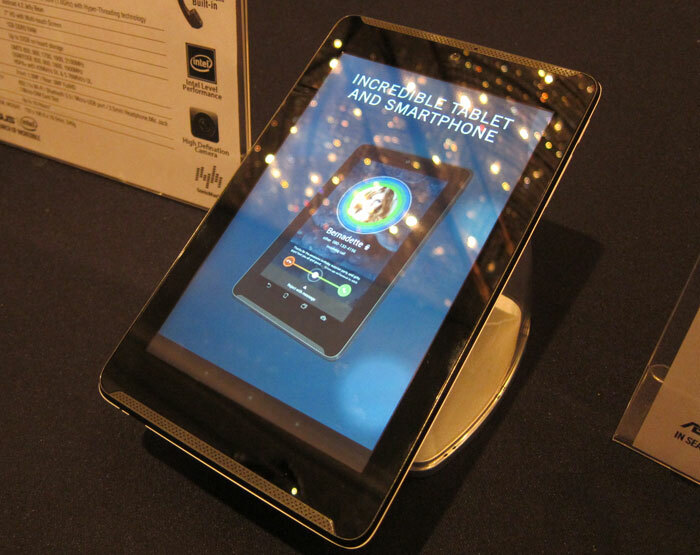 It's not exactly a new product, as the ASUS FonePad has been launched earlier in the year. However, on top of having a new and more descriptive name, the ASUS FonePad 7 has been updated with the latest dual-core Intel Atom Z2560 processor, that has Hyper-Threading which provides for a better multi-tasking experience. The device has also been updated with a better 5MP rear camera for better photos, and two front facing speakers for a better multimedia experience. Unfortunately, that's where the upgrades stop. 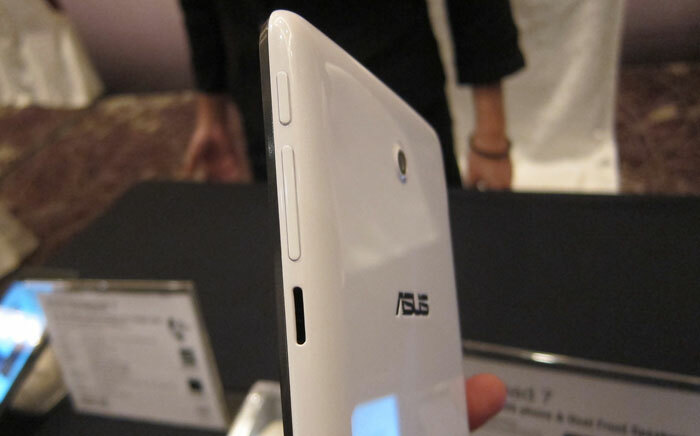 To keep the price (which has yet to be announced) as low as possible, ASUS gave the FonePad a pretty drastic overhaul. Instead of an aluminum body, the FonePad 7 now has a glossy plastic back (black or white) that's not quite as premium and adds 0.1mm to the overall thickness, but hides scratches much better. The display resolution also remains the same at 1280 x 800 pixels, as is its weight (340g), and onboard RAM (1GB). The FonePad 7 also has less onboard storage (8GB) compared to the original FonePad, which has 16GB, and only 3G connectivity instead of LTE. Even the battery is smaller, at 3950mAh, but consumers might not feel the difference thanks to the new Intel Atom processor. If you're looking for a more affordable version of the original FonePad, the FonePad 7 is definitely the device for you and will be available from 26 October. Right now, not all of the devices have their prices and availability revealed to us, but once we find out, we'll keep this space updated. Also take note that while there are plenty of products launched, there are still quite a few more that ASUS is still keeping under wraps, so keep a lookout for them here.